If you were wondering what the best painting in Los Angeles is right now, it's Johannes Vermeer's Woman in Blue Reading a Letter currently on view at the Getty Museum. And that isn't just some subjective opinion. It's a fact. Look it up. The painting is on loan from the Rijksmuseum, Amsterdam and will spend six weeks at the Getty before returning home. 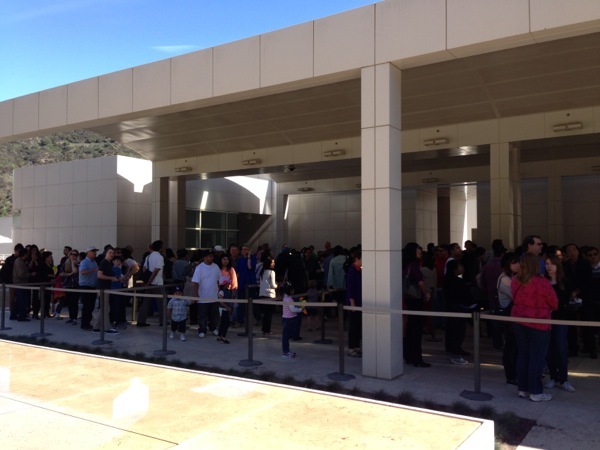 By 10:30 a.m. this past Saturday (the first day the painting was on view in Los Angeles) a long, snaking line of visitors had already formed to wait for the tram to transport them up to the Getty's hillside locale. The museum was packed, but surprisingly this did not lead to prohibitive crowds or long waits to see Vermeer's painting. Small to medium-sized clusters of onlookers gathered around the work in waves, the group refreshing every 60 seconds or so with new viewers. Though the crowd changed frequently, the conversation around the work remained remarkably similar. 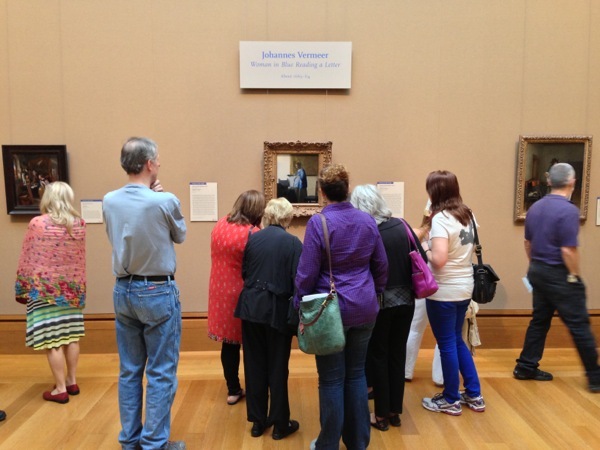 The most popular topic, by far, was whether or not the woman in the painting was pregnant. Opinions were mixed on the matter. The possibility that she was with child had been suggested in a Los Angeles Times article that morning which people cited repeatedly. Other topics of conversation revolved around information from the wall text posted next to the work - Vermeer's use of light and color, the intelligent composition, the pearls on the table. Also of note to many viewers was the painting's small size. It was only around 18 x 15 inches. Two people asked the security guard whether the large mark on the woman's face was her hair or an earring. One person speculated that it was a birthmark. By far, the adjective most used to describe the work was "stunning." 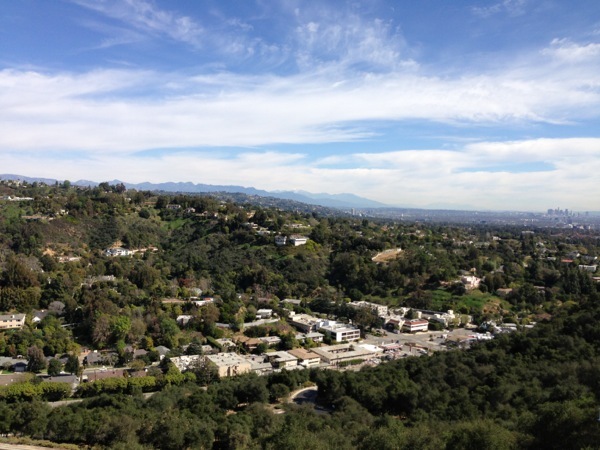 A view from the Getty Museum. But were people really stunned? Or did the fanfare that often surrounds exhibits like this, and painters like Vermeer, condition people towards stunned-ness? Did crowds single out this painting in a museum full of other significant works because it was truly a masterpiece? Or did they consider it a masterpiece because it had been singled out by the museum? Was it the painting's soft glow and sturdy composition that drew viewers instinctively over to it? Or was it the big signs in the museum's lobby that led them there? Perhaps the hype that surrounds a specific artist or artwork may end up shaping a viewer's opinion of it before they have a chance to form one on their own. Who knows? Either way, Vermeer's Woman In Blue Holding A Letter is the best painting in Los Angeles right now. You should go see it. Johannes Vermeer's Woman in Blue Reading a Letter is on view at the J. Paul Getty Museum in Los Angeles until March 31, 2013.